Retinopathy of prematurity is a vasoproliferative disease of premature babies, affecting the smallest and youngest infants. There are approximately 3.9 million infants born each year in the United States. About 14,000 of these develop some form of retinopathy of prematurity, but only 10% of these require intervention. Babies born at less than 1500 grams or 30 weeks gestational age are at particular risk. Anemia, poor weight gain, respiratory distress and other systemic co-morbidities also increase the risk of clinically significant disease. Even with treatment, 400-600 infants become legally blind from ROP each year in the US. Retinopathy of prematurity is the second leading cause of childhood blindness in our country. Screening for Retinopathy of prematurity often begins in the nursery, and is completed by an Ophthalmologist after dilation. Visits are repeated according to a protocol and vary depending on disease severity, speed of progression and child’s corrected gestational age. Often, additional visits are required after discharge and it is very important that follow up visits be completed. Failure to follow up as instructed can lead to irreversible vision loss. 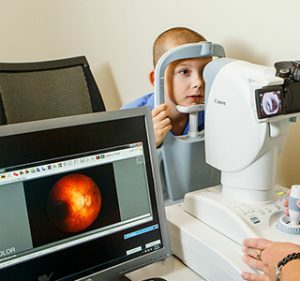 At Pediatric Eye Consultants of North Florida, we will gladly arrange your appointment time to accommodate your schedule and will provide a special secluded waiting area for you and your newborn. Retinopathy of prematurity progresses through certain stages and zones. Most ROP will regress spontaneously, but some cases reach a level of severity associated with a high risk of retinal detachment. If the risk of retinal detachment and visual loss become great, intervention may be recommended. Treatment options include laser therapy, intraocular injection with anti-proliferative medications or retinal surgery. New treatment options for ROP have surfaced over the last decade. Many of these show great promise, but remain controversial. Dr. Duss has extensive experience with Avastin and cutting edge therapies. She works closely with local retinal specialists when necessary to provide the best plan of care for each individual child. Even with successful regression, infants with retinopathy of prematurity often develop other eye problems including strabismus, amblyopia and significant refractive error. They may require eyeglasses, patching therapy or eye muscle surgery even years after their discharge from the hospital. Therefore, every child with a history of prematurity should be followed by a pediatric ophthalmologist during the years of visual development.